How Much Does an FFL Cost? An FFL costs between $30 and $200 for 3 years. The most common type of FFL, a Type 1 Dealer’s license, has a license cost of $150 for the first three years and $90 to renew your FFL thereafter. The cost for your initial Federal Firearms License, SOT registration, and other secondary costs can all depend on the FFL license type you want/need. Let’s look at the types of FFLs first to help determine what you might need. Which FFL license type should you get? There are currently 9 different types of Federal Firearms Licenses (FFLs) – these range from your typical gun dealer/gunsmith FFL (Type 1) all the way up to firearm manufacturer and importer FFLs. For a more information, see the article on FFL Types or, better yet, sign up for an online course to help you Get Your FFL. For a simplified break-down of which type of FFL allows which kind of firearm or ammunition activity (dealer, gunsmith, pawnbroker, curio and relic C&R collector, manufacturer, or importer) please see the chart below. Note the columns which help you to determine what each type of FFL will allow and which Class of SOT may be required. Only the Type 9, 10, and 11 FFLs can work with ‘Armor Piercing Ammunition’ and ‘Destructive Devices.’ Therefore, a Type 1 FFL can deal in standard firearms but not Armor Piercing Ammunition nor Destructive Devices. A Type 9 FFL, on the other hand, can. The two most popular types of FFLs are the Type 1 dealer/gunsmith FFL and the Type 7 firearm manufacturer FFL. As you can see in the chart below, each FFL lasts for 3 years. Depending on which FFL License type you get, the FFL cost ranges from $30 to $3,000 for the first three years. Let’s cover the costs from least to most expensive. When you’re looking at the application fees, don’t panic! I’ll show you below how you can make back the cost of your FFL, and more, at the end of this article with your first two firearms! 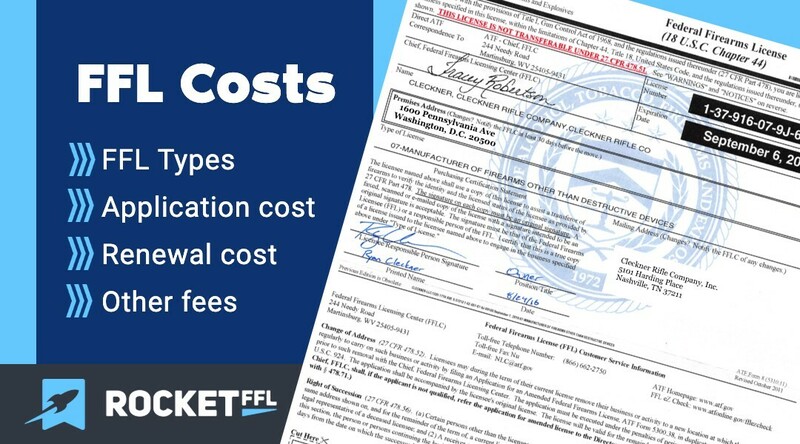 $30 application fee FFLs – these are the Type 3 and Type 6 FFL licenses. These are both unique because they may NOT be used for typical firearms transfers. Any other firearms which derive a substantial part of their monetary value from the fact that they are novel, rare, bizarre, or because of their association with some historical figure, period, or event. The Type 6 FFL is the Ammunition Manufacturer’s FFL and may NOT be used for firearm transactions! Be very careful here. If you are an FFL, you must pay special attention to the FFL License Number to ensure that you are shipping a firearm to an eligible FFL. As you’ll learn in our article on FFL ID Numbers, each number means something and you must pay attention. 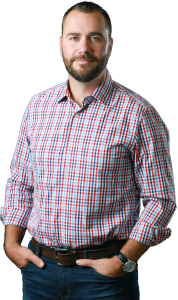 $150 application fee FFLs – these are the Type 7 manufacturer’s license and the Type 8 Importer’s license. These licenses are used to manufacturer or import GCA/Title I firearms. If you are also a Special Occupation Taxpayer (SOT), then these licenses may be used to manufacture or import NFA/Title II firearms also. In addition to their primary purpose, both of these licenses can also be used to deal (buy/sell) firearms. $200 application fee FFLs – these are the Type 1 firearm dealer/gunsmtih’s license and the Type 2 pawnbroker’s license. These are your most common store-front gunshop licenses. Interestingly (to me, at least), these licenses cost more up front than a Type 7 manufacturer’s license which allows you to manufacture and deal in firearms. $3,000 application fee FFLs – these are the Type 9 dealer’s license, the Type 10 manufacturer’s license, and the Type 11 importer’s license. These licenses are very similar to their counterparts with one major difference: all three of these licenses allow the particular activity to be conducted with Armor Piercing Ammunition (AP) and Destructive Devices (DD). Before 3 years is up, you’ll need to renew your FFL. Just as the initial application cost for each FFL varied, so too does the renewal cost. Remember how the license to manufacture and deal (Type 7) was cheaper up front than the license to only deal (Type 1)? Well, that changes at renewal time. The Type 01 FFL is so much cheaper to renew than the Type 07 FFL that is ends up being less money out of pocket by your fourth year in business. The Type 1 FFL will cost $290 in your fourth year whereas the Type 7 FFL will cost you $300 in your fourth year. In fact, the only Federal Firearms Licenses that have a renewal fee that is cheaper than their application fee are the Type 1 and 2 FFLs. Unfortunately, the actual FFL cost may not be the only fee you’ll have to pay. Depending on what you are going to do with an FFL, there may be some extra costs. 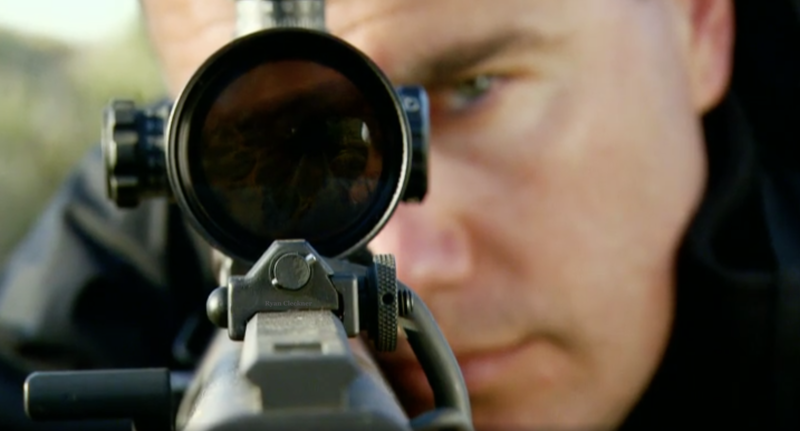 If you plan to work with NFA firearms (silencers, short barreled rifles, machine guns, etc. ), then you’ll need to register as a Special Occupational Taxpayer (SOT). Depending on your FFL license type, you’ll either need to be a Class 1, 2 or 3 SOT. See the chart below to help determine which class of SOT registration each FFL requires. The SOT registration is good for one year from July 1 to June 30. Therefore, if you start in this business in the first half of the year, you might be stuck paying for a full year’s registration and only get a couple months of use out of it because it’ll expire on June 30th. The good news is that you’ll likely be in the “under $500k yearly sales” category below so you won’t waste too much money. If you’re wondering more about what an SOT is, check out the article What is an SOT?. If you’d like to get your FFL and become an SOT, sign up for your Guide to Get Your Own FFL and Become an SOT course bundle to save money! If you meet the State Department’s definition of a manufacturer, then you must register with the Directorate of Defense Trade Controls (DDTC) per the International Traffic in Arms Regulations (ITAR). If you’re not sure about this, please consider taking the Guide to Get Your Own FFL to learn more. The cost to register is $2,250 every year and the State department enforces this one – be careful! Here’s my warning – the ATF and the State department do not agree on the definition of a manufacturer. You can be a “manufacturer” in the eyes of the State Department with certain activities under a Type 1 dealer/gunsmith FFL. Likewise, just because you have a Type 7 manufacturer’s FFL doesn’t mean that you are necessarily a “manufacturer” in the eyes of the State Department. If you’re a manufacturer and make 50 or more firearms per year, then you must pay 10-11% (depending on firearm type) of the firearm’s value as an excise tax. This is steep! It just isn’t worth making 51 firearms in a year. Keep it at 49 or go to 100 or more to make it worth your time. So, how much does an FFL cost? As you can see, it depends on what you want to do with your FFL. If you want to be a dealer in standard firearms (non-NFA), then you can be up and running for three years as an FFL for $250.93 (that’s $200 to the ATF, $49.95 for your Get Your FFL course, and two postage stamps at 49 cents a piece). If you want to be a manufacturer, especially of NFA firearms, it’s going to cost you a bit more. DON”T LET THE FFL COST DISCOURAGE YOU! Remember, you are doing this to save and make money with firearms! Remember, you can recover the cost of your FFL in as little as two firearms! The MSRP for a Glock 19 is $599. The FFL cost for that gun from Lipseys.com is only $440! That means you can make/save $159 on only one Glock 19 – you’ll be able to off-set your FFL cost after your second gun! Ok, you now know what the FFL cost of each type of Federal Firearms License is – are you ready to Get Your FFL? Check out our article on How to Get Your FFL License for more info or sign up for our online FFL Course. How much will it be to convert a type 10 into a type 20 on 1st purchase? A type 10 is 3,000$ how much for a type 20? I’m doing my app in 1 week. The type 20 is an FEL, and not an FFL. Unfortunately, our courses and info only cover FFLs. Also, there is no “converting” of FFLs – you can get an additional/new one and also have the original too or let it lapse. What’s the difference in a class 8 and class 11 FFL license? Is there an ITAR tax/fee on a type 7. $2500 per year? No. Just having a Type 07 does not require a fee. On the other hand, the fee can apply without a Type 07. We discuss this in our courses. I would like to start manufacturing shotgun ammunition with a type 7 FFL. Will I need to register with the ITAR/DDTC if i am only manufacturing ammunition? And, will I incur the excise tax for ammunition manufacturing? This is partially covered in our Get Your FFL course and will be addressed better in our soon to come ATF Compliance course and Import/Export Course. What about an FFL in California? I am planning to do the course but want to make sure that I can get an FFL in the state of California. Eventually I want to become a SOT as well. 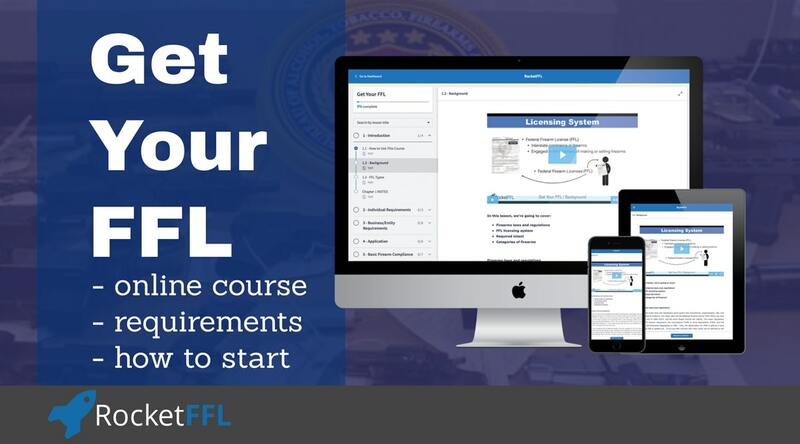 Our FFL course can help you get your FFL in California. Ryan, Do you know what FFL Level is required in California with the new ammunition laws restricting consumer purchases? Before 2018 a consumer could order from out of state ammo dealers. Now an out-of-state supplier sends it to an FFL for consumer to acquire. I believe beginning in 2019 these transactions (acquisition & treansfer to consumer) must be reported to a state agency. So curious if a Type 1 FFL will suffice? Thank you. I just purhased the initial rocket bundle – good so far! Thanks for the great info. I believe I would be a class 3 but not sure. I am a gun collector but not relics. Whenever I buy a gun online, it cost beteween $30-$50 to transfer it. That looks like the one year cost for an FFL. If f I sell a gun, I sell it back to a gun shop. Can I get an FFL to buy guns direct? Absolutely! You can order guns at dealer cost straight to your home if that’s where you get your FFL. Great question! It depends on the type of FFL you get, what type of SOT you become (for class 3), and how much you sell each year. Don’t worry though, we break it down simply in our “get your FFL” course. Lipseys.com, they sell only to FFLs with physical storefronts and minimum yearly/monthly turnaround? Or they sell to any FLL for personal usage? Lipseys is our favorite distributor – they definitely sell to home-based FFLs.